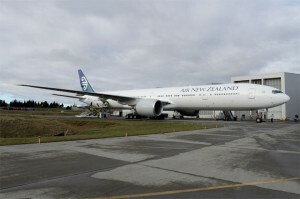 Air New Zealand took delivery of their first Boeing 777-300ER aircraft on Wednesday at a ceremony at Boeing’s Paine Field assembly plant in Everett, Wash. 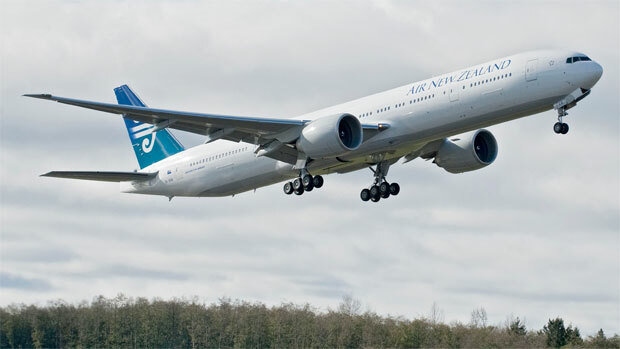 The Auckland-based carrier ordered five of the aircraft in August 2007 to augment its existing long-haul fleet of eight Boeing 777-200ERs. 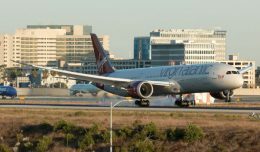 They plan to use the first three deliveries on service between Auckland, Los Angeles and London beginning in April 2011. 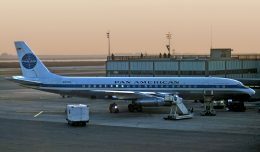 Come back Monday for a full trip report from NYCAviation correspondent Jeremy Dwyer-Lindgren, who was onboard the delivery flight from Everett to LAX. Air New Zealand’s new 777-300ERs are configured with a number of innovative features in Economy, Premium Economy and Business Premier classes. The most buzzed about feature may be the Skycouch/CuddleClass seats in economy, the first lie-flat economy class product in the industry. “Spaceseats” in the Premium Economy section offer larger seat area and greater pitch. All seats have in-seat power and USB connections, allowing passengers to connect their MP3 players with the in-flight entertainment systems. 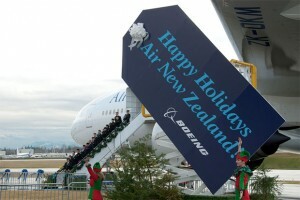 Air New Zealand currently has 35 Boeing jets in its fleet and will be the first to take delivery of the 787-9 Dreamliner, with eight on order. The airline also operates Boeing 737-300s, 747-400s and 767-300ERs. The 777-300ER is 19 percent lighter than its closest competitor, greatly reducing its fuel requirement. It produces 22 percent less carbon dioxide per seat and costs 20 percent less to operate per seat. 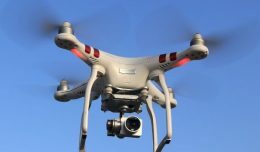 The airplane has a maximum range of 7,930 nautical miles (14,685 km). 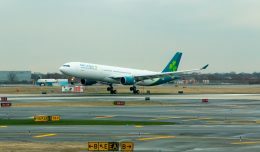 The 777 family is the world’s most successful twin-engine, twin-aisle airplane. Sixty-one customers around the world have ordered more than 1,100 777s.